Lace up and hit the streets or the beach for a run. Pedal in paradise and swim in the Gulf waters. We’ve got your fitness options in Coastal Alabama. Pedal for a great cause at the annual RIDEYELLOW in Bay Minette. There are plenty of runs, rides and ways to stay fit in Mobile. The Azalea Trail Run is a 10K held in March down the streets of old Mobile when the city is in full bloom. Mobile’s First Light Half Marathon, a USATF-certified course, travels through downtown, midtown, Spring Hill areas of Mobile. The Crepe Myrtle Trail Ride is an exciting sight, where hundreds of riders of all ages and abilities bike the eastern side the Mobile Aeroplex of Brookley enjoying beautiful views of Mobile Bay in early April. With a name like Gears & Beers, you just can’t go wrong with this one! This early November fundraiser benefits the Delta Bike Project, Mobile’s community bike shop, and offers 10-, 30-, 63- and 100-mile rides that all converge at a massive and must-see street party in historic downtown Mobile. The Eastern Shore Trail maintained by the Baldwin County Trailblazers. This 23-mile National Recreation Trail connects Spanish Fort to Weeks Bay. It consists of concrete sidewalks and asphalt elevated boardwalks and low bridges, shared by runners, pedestrians and cyclists. Each year the Grandman Triathlon, a fundraiser for Mobile Baykeeper attracts athletes from across the country to the Fairhope Pier. The race includes a 1/3 mile swim, 18.6 mile bike ride and 3.1 mile run. As the tagline says, this is more than just a bike ride. Each year hundreds of folks bike to raise money for cancer charities in the RIDEYELLOW race. To date they’ve generated more than $475,000. 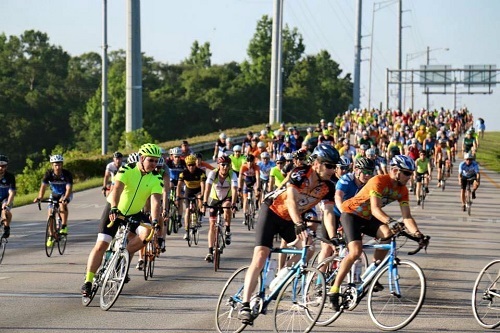 The race includes a six-mile tribute ride, with a slow pace; a 10-mile flat course; a 20-mile route; a 37-mile moderately hilly course; and a 62-mile ride for experienced riders. Experience the Delta like never before! North Baldwin’s Delta Dash is a 5K obstacle course race designed to challenge the heart, body and soul. The goal is simple; provide participants of all lifestyles and ages with an opportunity to test endurance, stamina, resilience, quick decision making skills, animal instinct—all while donning a face-full of mud, leaves, and whatever else the terrain throws their way. The Delta Dash covers three miles of wooded terrain where several obstacles are encountered. Obstacles could be anything from crawling in mud, wading through a creek, speeding down a mega slip-and-slide and scaling hay bales. Hike or bike on the Hugh S. Branyon Backcountry Trail. Stretching for 28 miles across Gulf Shores, Gulf State Park and Orange Beach, this trail system invites all fitness levels to get out, get active and explore the unique ecosystems on Alabama’s beaches. Bike rentals are easily arranged. Alternatively, you can go on a Segway Park Tour or a guided walking tour. Head down to the beach to walk or jog around Gulf Place, walk the beaches and search for shells. This is a favorite pastime for locals and visitors, and it’s also a great way to stay active while on your vacation. And if you’re around between May and October, join the early morning turtle watchers as they work with Share the Beach to protect and educate visitors on the endangered sea turtles that nest in our area. Enjoy walking or biking along nearly 30 miles of biking and walking paths throughout Foley. Get a map for the multi-use paths at the Foley Welcome Center. Enjoy a ride through southeast Baldwin County with the Tour de Foley each November. The rides travel through flat and rolling rural farmland in and around the beautiful towns of Foley, Robertsdale, Loxley, Summerdale, Elsanor and Elberta. Activities include bike safety awareness, used bike drop off, bike maintenance clinics and cycling vendors. Put on your running shoes for the Rotary Club Oyster Run through historic downtown Foley every November. Events include a 5K Run, Walk and 1 mile fun run. Creek Crawl is held at Graham Creek Nature Preserve in November. This is a cross-country mud run includes challenging obstacles amidst miles of muddy terrain.